Hi Guys... I"ve been reading posts on this web site for about 8 or 9 months now and I'm alittle ashamed to admit that I have no Idea who John Larson was or what's his significance to this web site. Please understand, I mean no disrespect at all. It's obvious from everything I've read here that everyone loved the man. What better tribute to a man than that right? But I would like to know ( if someone dosn't mind taking the time to educate me ) alittle background on Mr. Larson and his importance to this site... I appreciate the information. John was the father of the toon forum. I think he started a MSN group for pontoons and then started the other PDB forum. I joined the other about 2 weeks before John died of a heart attack. I remember his brother keeping us informed as his condition worsened. Though I didn't know him I to felt the love and respect the had from other members. Thanks for the info LR... I could tell by all the posts I've read that John was held in high regard. Now I have a little back ground on his importance to this particular web site... thanks again. John was just one of those guys you love right off the bat, even without meeting him, he could reach out and touch your heart through the Internet. He was the first guy to welcome new members at PDB even though it wasn't his forum and he had his own going too, but he was there to help and pass on jokes and make funny comments. He loved it when you left open ended statements or stated it the wrong way and turned it funny. But mostly he turned PDB into a good place to be and made you want to sign in every day to see what was going on, people just joined for help with pontoons and found a great place to be, talking about our toys, fishing or what ever and never left. He showed us how good a forum could be and set the standard for the rest of us to live up to, so now we do our best to keep the his friendly ways and make sure to welcome new members and share pictures of our good times on the water. When had his heart attack, you had hundreds of people who never met him, checking in on the forum for four days with prayers for John and waiting for good news that never came. When John passed, he had grown men, most who never met him in person, crying like babies, because we knew we were going to miss him and his posts. I never got to meet the guy, I have read a lot of his great posts and gained a huge respect for him. Plus who can't get a chuckle out out the name he gave his boat. 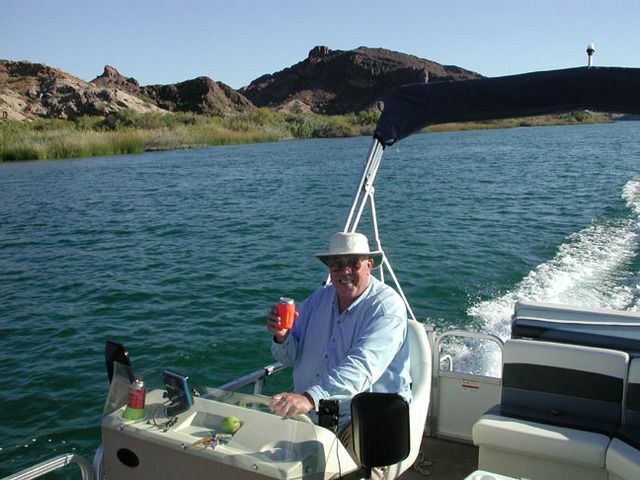 Mr John is called the godfather of this site and he was the person who started the MSN group for the pontoons. And he was also the starter of PDB forums also. He made us understood how good a forum could be and set up the standards for rest of us to live up to. By appreciating his these efforts, we should do our best to keep up his all friendly ways and make sure to welcome new members. I also have wondered, who he was. One of my favorite pictures of 6x6, holding his beer up to say cheers, this was right after he installed the mirrors on his council, he said now I can see without having to turn my head away from my beer , the ball to play with the dogs, you don't see them but they didn't let him leave without them. Great picture. Wish I had had a chance to meet him on his site. Sounds like a great man. Plus I am diggin' the mirrors, great idea! John and I became very good friends on this forum. He and I both shared a love for boats and handguns. We had many off forum conversations. When I asked him for the first time to send me a pic of what he looked like, this is what I got!